Now who doesn’t want to win a million bucks? 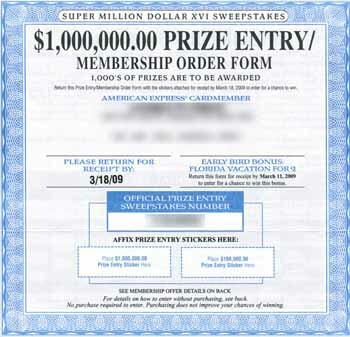 However before you rush to your mailbox for your chance to cash in and beat the recession take real good look at the third line which says: “membership order form”. I know that it doesn’t catch your eye because of the way text is placed on the page but it’s there. Then you would want to carefully read at least the reverse of the form for details on the price of this membership. You would be glad you did. Other less colorful but more informative papers are also worth reading. What makes this one subtle is that it originates from a credit card company so you don’t need to provide your billing information in order to get billed – they already have it! Oh, and the kindle post – it’s coming too – stay tuned. This entry was posted in Offtopic by Dzmitry. Bookmark the permalink.